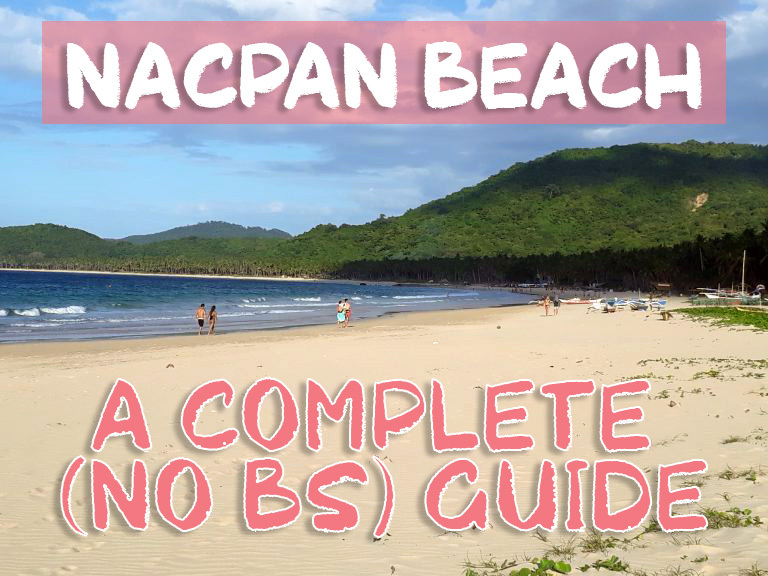 This guide will give you a realistic review of Nacpan beach. No BS, no overly descriptive writing, no pictures of us in bikinis. Just good honest review of Nacpan beach with real photos. Use the filters below to find the exact information that you need. Most beaches in El Nido are beautiful. Nacpan beach is no different. The beach stretches out for 3km and is made of soft yellow sand. Lush green palm trees line the beach and lush green islands surround the beach landscape. The most famous part of the beach is on the far southern tip. This is where Nacpan meets neighbouring Calitang beach. This is also where most visitors take their Instagram pictures. If you are looking for a beach to sunbathe, eat, sleep and relax the north of Nacpan beach is quieter. You might also prefer to visit Lio beach which is quieter than Nacpan. It is also closer to El Nido, has better food options and it is equally as beautiful. Tricycle (takes 1 1/2 hour). It takes a little longer to get to Nacpan by tricycle due to the 4km of dirt road leading up to Nacpan beach. If it has been raining the night before you will likely get stuck once or twice in a muddy ditch. With a little bartering, the cost will be 1,100 – 1500 pesos. Moped Hire. (takes 45min – 1hour). There are plenty of places to rent a moped in El Nido and fill up with gas along your journey. The average price for a moped is 600 pesos a day. Tour E (half day tour). You can book ‘Tour E’ from any one of the many tour operators in El Nido town. All operators sell standardised tours including Tour A, B, B, D, and E. During Tour E you will visit various destinations including Nacpan beach. Shuttle Bus (takes 1 1/2 hour). Aircon shuttle buses offer hotel pick up from El Nido and drop off services to Nacpan beach for around 600 pesos. The trip from El Nido to Nacpan beach is pleasant. You’ll see mountains and rice paddocks along the way along with a few grazing cows. Most of the roads are ok although you will find potholes along the way. When you reach the sign for Nacpan the roads become dusty and bumpy. The first 20km of the road going from El Nido to Nacpan beach are mostly smooth with pleasant mountain views. You can easily pick up gasoline from various shops along the way. Some parts of the road have loose gravel, potholes and roadworks that you need to look out for. Look out for this sign around 20km along your journey. Turn left when you see it which will take you to Nacpan beach. From this point, the roads become dusty and bumpy. Most of the road leading up to Nacpan beach are bumpy and dusty. The following accommodation are the closest to the beach. Massage: There were 2-3 massage beds set up in the middle of the beach offering messages for 500 pesos per hour. Hike: You can do a mini hike on the hill next to the twin beach. Kayak: There is a shack close to the middle of the beach offering kayaks for 250 pesos per hour. Paddleboarding: There is a shack close to the middle of the beach offering paddleboards for 250 pesos per hour but the water is choppy so it isn’t the best beach for paddleboarding. Beach volleyball: There is a volleyball net at Mad Monkeys Hostel. If you are staying or drinking there you can join in a communal game. Eat & Drink: Small shacks lined along the beach offer seafood and local food. They also offer cocktails, beers and daily happy hours. Toilets: toilets are poor by western standards. The best toilets are at Mad Monkeys but they are still not great. Sunbeds: There are 20 or so sunbeds available in the middle of the beach which you can rent. Bars and restaurants: Shacks are scattered along the beach. Watersports rentals: There is a shack in the middle of the beach offering rental of paddleboards and kayaks. Wifi: like most beaches in El Nido wifi is not good. This picture is pointing towards the southern side of the beach. Sunbeds are available in the centre of the beach. Bars and restaurants (shacks) are scattered along the beach. You will find most of them towards the middle of the beach. Walking south along Nacpan you will find Mad Monkey Hostel. This is a picture of a typical scene around 4pm. There are lots of young travellers drinking on the beach with a lively atmosphere. Beach volleyball outside Mad Monkeys Hostel. As you walk to the far southern tip you will find twin beach where Nacpan meets Calitang where it becomes alot quieter. You will find a few fishermen huts, boats and crabbing nets scattered around. Here are a few pictures of the twin beach where Nacpan meets Calitang. Do you know something about Nacpan Beach that we have not included? Want us to add it to our review? No problem, submit your edit here and we will review it. If it looks like a good inclusion we will add it and credit you with a link.